Category Archives for "Hoje na História"
– 710 – Saracen invasion of Sardinia. – 939 – Edmund I succeeds Athelstan as King of England. – 1275 – Traditional founding of the city of Amsterdam. 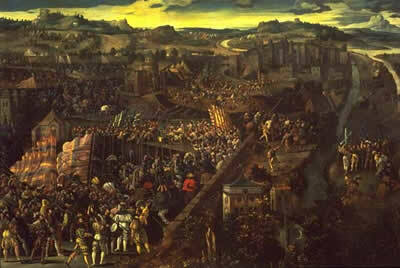 – 1524 – Italian Wars: The French troops lay siege to Pavia. – 1553 – Condemned as a heretic, Michael Servetus is burned at the stake just outside Geneva. – 1644 – Second Battle of Newbury in the English Civil War. – 1682 – Philadelphia, Pennsylvania is founded. – 1795 – The United States and Spain sign the Treaty of Madrid, which establishes the boundaries between Spanish colonies and the U.S.
– 1806 – The French Army enters in Berlin.